PHOTO BY GOAT FACTORY MEDIA ENTERTAINMENT Anna Lentz as Anne Frank in Geva's production "The Diary of Anne Frank." There's a great responsibility and gravity that comes along with staging (and reviewing) a show like "The Diary of Anne Frank." The Holocaust wasn't even a hundred years ago, but feels at once farther and closer, in many ways. While connections have been made between that era and the current political climate, many Holocaust survivors and their loved ones are no longer living, and generational ties have weakened. The stories of the Holocaust need to continue being told, and theater is an effective way to educate the population. 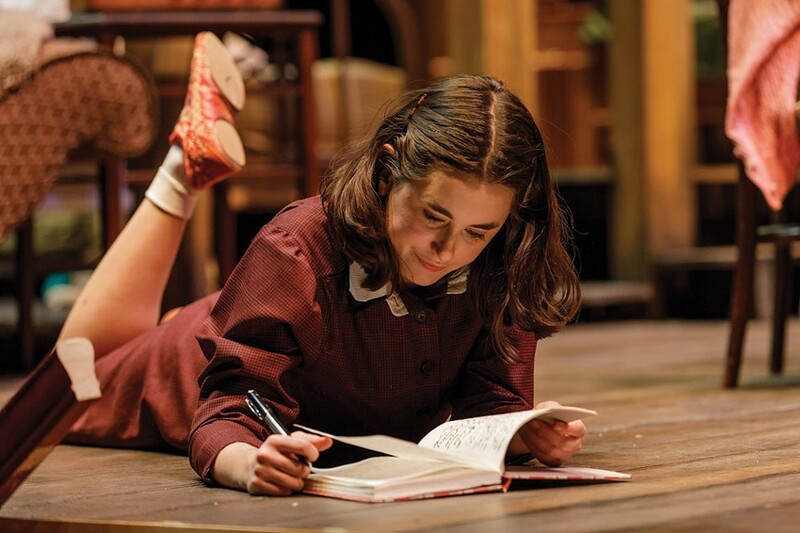 "The Diary of Anne Frank," by Frances Goodrich and Albert Hackett (playwrights and screenwriters of films such as "Father of the Bride" and "Seven Brides for Seven Brothers"), adapted by Wendy Kesselman, stays true to Frank's writing. There are many scenes that directly quote passages from her diary, and the timeline focuses on the nearly two years the refugees spent in the secret annex. The 1955 play received the Tony Award for Best Play, the NY Drama Critics Circle Award for Best Play, and the Pulitzer Prize for Drama (Kesselman's 1997 adaptation of "The Diary of Anne Frank" was nominated for a Tony Award for Best Revival of a Play but didn't win). But while this retelling of Anne Frank's haunting story received accolades on Broadway, Geva's production leaves a particular element to be desired. It's unclear whether Anna Lentz (Anne Frank) interprets the character in a way that doesn't work, or whether she was guided by Director David Ira Goldstein (artistic director emeritus at Arizona Theatre Company, which is co-producing) to play the role that way. Regardless, there's a blatant disconnect from historical depictions of Anne Frank as a spirited but sweet child of the 1940's. Here, Lentz portrays Frank as an overbearing, often sullen brat whose body language and intonation come off as very modern. It's as though a twisted iteration of Veruca Salt from "Willy Wonka and the Chocolate Factory" was somehow transported into the wrong show. Lentz's Anne — who should be driving the emotional pace of the production with her every word, as Frank does in her diary — is not only hard to follow, she's downright unlikeable. And that simply cannot be the case when such a powerful story is being staged. Fortunately, there is some saving grace amongst the ensemble performances. Steve Hendrickson (Otto Frank), who was last seen at Geva as Scrooge in "A Christmas Carol," gives a marvelous interpretation of Frank's gentle and giving father. His ending scene provided some of the most moving moments — and seemingly the only moments where people were reaching for tissues. Michael Santo (Mr. Dussel) is a deadpan foil to other characters' overstated drama, creating welcome comic relief; and Kit Prelewitz (Miep Gies) makes a kind and sophisticated impression during her brief scenes onstage. Bill Clarke's scenic design provides an innovative, fluid aesthetic that features every actor prominently; while Mimi Maxmen's costume design encompasses both function and a nod to the wealthy history of the characters (Mrs. Van Daan's fur coat and Anne's flowered heels are especially beautiful touches). It's worth noting the admirable work Geva has done to create experiences around "The Diary of Anne Frank." A partnership with The Strong and the Jewish Federation of Greater Rochester yielded a free exhibit in the lobby and upstairs lounge. One particular portion of the exhibit features small black buttons etched with the phrase "How do I make a difference today?" — patrons are encouraged to take a button or two, and even pass them on. Post-show talkbacks with the Jewish Federation will also take place after the Sunday matinees on March 4, 11, and 18. Geva is also partnering with Pittsford Mendon High School for the Stage Door Project: a one-time version of the show, at Geva, featuring a completely high school-aged cast and crew. The high schoolers have been shadowing the professional cast and crew, and will perform their production on Thursday, March 15, at 7:30 p.m. While "The Diary of Anne Frank" does not feature the strongest ensemble in Geva history, seats will fill and the end-of-show ovation will continue through the run. Audiences will attend and applause each night, standing as they should to pay tribute to the Franks, the Van Daans, and thousands of other untold stories of Holocaust victims.